Paul Thomas Harris passed away on February 14, 1938 of a stroke at age 76. A funeral was held at his home on the 16th, conducted by his branch president, Ora Layton Alldredge, a former missionary. On January 22, 1974 and April 19, 1975, proxy temple ordinances were performed for Harris in the Mesa, Arizona and Los Angeles, California temples, including priesthood ordination and the temple endowment. It is likely that those who performed the ordinances for Harris were unaware of his race, given the Church-wide proscription against ordaining men of black African descent that remained in place until June 1978. Badger, Howard Carl. Journal (1914-1917). Manuscript. MS 25826. Church History Library, Church of Jesus Christ of Latter-day Saints, Salt Lake City, Utah. Church of Jesus Christ of Latter-day Saints. Record of Members Collection. CR 375 8, Reel 6498. Church History Library, Church of Jesus Christ of Latter-day Saints, Salt Lake City, Utah. “District Highlights, Transvaal.” Cumorah’s Southern Messenger, vol. 12, no. 3. (March 1938), 47. Sharp, June B. Journal, 1913-1915. Manuscript. MS 14361. Church History Library, Church of Jesus Christ of Latter-day Saints, Salt Lake City, Utah. ________. Photograph album, 1910-1929. PH 8472. CHL. Smith, Nicholas Groesbeck. Journal, 1915-1921. Manuscript. MS 8816. Church History Library, Church of Jesus Christ of Latter-day Saints, Salt Lake City, Utah. Stoddard, Alexander Lester. Journal, 1916-1919. Manuscript. MS 7365. Church History Library, Church of Jesus Christ of Latter-day Saints, Salt Lake City, Utah. “Transvaal District.” Cumorah’s Southern Messenger, vol. 11, no. 1 (January 20, 1937), 14. United States. National Archives and Records Administration. Passport Applications. Paul Thomas Harris, December 31, 1920. Krikler Krikler, White Rising: The 1922 Insurrection and Racial Killing in South Africa (Manchester, UK: Manchester University Press, 2005). Rogers, Orson M. “Native Races of South Africa,” Improvement Era, vol. 12, no. 8 (June 1909), 625-635. Stevenson, Russell, For the Cause of Truth and Righteousness: A Global History of Blacks and Mormonism (Salt Lake City: Greg Kofford Books, 2014). Wright, Evan P. “History of the South African Mission, Period II, 1903-1944.” Typescript. Church History Library, Church of Jesus Christ of Latter-day Saints, Salt Lake City, Utah. United States. National Archives and Records Administration. Passport Applications. Paul Thomas Harris, December 31, 1920. See also Church of Jesus Christ of Latter-day Saints, Record of Members, Johannesburg Branch, CR 375 8, Reel 6498, Church History Library, Salt Lake City, Utah. Church of Jesus Christ of Latter-day Saints, Record of Members, Johannesburg Branch. Brough served in the South African Mission from 1907-1910; Houtz served from 1908-1911 (“Early Mormon Missionaries” database, history.lds.org/missionaries, accessed October 6, 2017). Their descendants are unaware of any extant journals or letters dating to their time in South Africa, making it difficult to know much about the circumstances of his conversion. 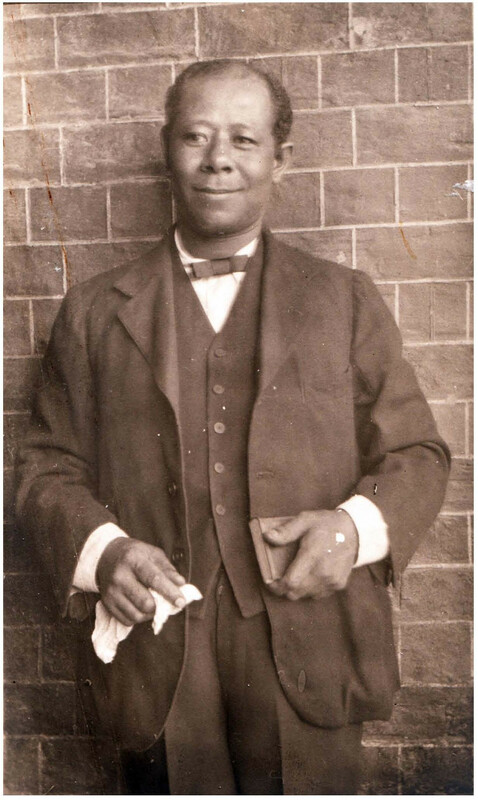 Another notable early black convert was William Paul Daniels, who was baptized in 1915 and lived in Mowbray. See Russell Stevenson, For the Cause of Truth and Righteousness: A Global History of Blacks and Mormonism (Salt Lake City: Greg Kofford Books, 2014), 48. For an example of missionary attitudes toward and instructions regarding black South Africans at the time of Harris’s conversion, see Orson M. Rogers, “Native Races of South Africa,” Improvement Era, vol. 12, no. 8 (June 1909), 625-635. White South African church member Johannes Paulus Brummer is known to have occasionally attended the meetings at Harris’s home with the North American missionaries. See Nicholas Groesbeck Smith, Journal (1915-1921), July 11, 1918 and Alexander Lester Stoddard, Journal (1916-1919), July 11, 1918. See Nicholas Groesbeck Smith, Journal (1915-1921), July 5, 1915; June B. Sharp, Journal (1913-1915), January 5, 1913; Alexander Lester Stoddard, Journal (1916-1919), July 2, 1917. Alexander Lester Stoddard, Journal, July 2, 1917. Evan P. Wright, “History of the South African Mission, Period II, 1903-1944,” 105. She is mentioned briefly in several entries in Alexander Stoddard’s missionary diary, identified only as “Mrs. Harris” or sometimes “Sister Harris.” Her birthday was June 23 (Alexander Lester Stoddard, journal [1916-1919], July 2, 1917 and June 23, 1918). Roughly equivalent to $25,000 per annum in 2017 dollars. United States. National Archives and Records Administration. Passport Applications. Paul Thomas Harris, December 31, 1920. The Fordsburg barracks were the site of racial violence in 1922 during the Rand Revolts. Protests by working class whites, who resented being replaced by black workers in the mines near Johannesburg, erupted into violent demonstrations and led to racially motivated homicides. See Jeremy Krikler, White Rising: The 1922 Insurrection and Racial Killing in South Africa , 182-184, 217-219. Alexander Lester Stoddard. Journal, June 1, June 25, and July 2, 1917. “Affidavit to Explain Protracted Foreign Residence and to Overcome Presumption of Expatriation,” and Tom Hazell affidavit, attached to United States. National Archives and Records Administration. Passport Applications. Paul Thomas Harris, December 31, 1920. The application also contains a physical description and photograph of Harris, noting that he stood about five feet, five inches tall. In one instance, the missionaries delivered groceries donated at a branch activity. In other cases, they delivered cash. Amounts ranged from a few shillings to a pound and a half. Howard Carl Badger. Journal (1936-1937), April 20, 1936, August 6, 1936, September 10, 1936, November 6, 1936, December 11, 1936, and January 30, 1937. “Transvaal District.” Cumorah’s Southern Messenger, vol. 11, no. 1. (January 20, 1937), 14. Howard Badger, Journal (1936-1937), January 9, 1937. Church of Jesus Christ of Latter-day Saints, Record of Members, Johannesburg Branch. “District Highlights, Transvaal,” Cumorah’s Southern Messenger, vol. 12, no. 3 (March 1938), 47. Paul Thomas Harris (972M-SJZ/KWJV-8L3), ordinance records on familysearch.org (accessed October 5, 2017). His name may have been one of millions submitted for ordinance work via the “name extraction” program sponsored by the LDS Church’s Genealogical Department beginning in 1961. See Kahlile Mehr, “Name Extraction Program,” Encyclopedia of Mormonism, 3:979-980.